Our heavily unused second bedroom on the second floor has undergone a bit of a makeover over the last few weeks. It started out as a playroom for the cats, complete with a shredded cat tree. Then, when Justin and I put the king-sized bed in our bedroom, we relocated our queen bed into this room and got rid of the mishmash of cat and craft and couch. But the room lacked trim and the closet was missing doors and an organization scheme. Now it has trim, new paint and a snazzy closet. We put the finishing touches on the paint this weekend and moved all of the furnishings back into the room today, freeing the hallway from the jumble. Here is the closet, complete with our bargain bi-folds and a homemade closet system. We have a table for sewing and crafts on the left side of the closet that I'm hoping to put to use soon for curtain and pillow making. Here's a rare shot of me working. Seriously, I do stuff but I'm also the historian so I'm usually the one behind the camera capturing the moment. I didn't get any action shots of us painting the walls but the room is small enough that the paint went on pretty quickly and we were done in a day. We've switched to Rodda paint from Valspar, mostly because I had a 2-for-1 coupon at Rodda. But after using it in the master bedroom, I was pleased enough with the coverage to go back. It's a little spendy (~$45/gal) without the coupon but very affordable at 1/2 price. 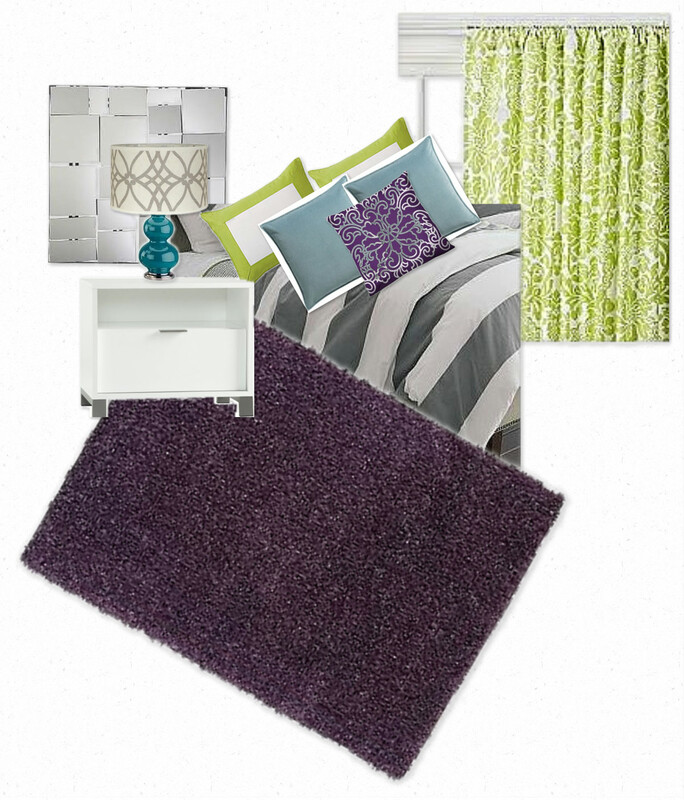 So, now we are onto the fun part of picking out some curtains and a duvet and some colorful accents. I think I am going to go with a dark blue and purple. The walls are a light gray that leans to the blue side of the spectrum. I had thought the walls would dry a little lighter but you get what you get. I like it though. I think it will make the room look brighter which is important since that window faces north. We're unlikely to have the blinds open much since the view is the house next door with its peeling paint and other maintenance issues. I'm really only set on the shag purple rug since I already own it. The bed, which I didn't feature in the montage is black and a bit contemporary. Everything else would be need to be acquired. I'm kind of excited about the plum-turquoise-lime green combination but I have some other ideas up my sleeve: red-pink-plum, orange-lime green-plum, and plum-navy. I'm thinking all of these would have a backdrop of white walls...and I'm leaning toward a white that has a drop of gray in it. Anyway, let me know if you think this is too much or if you have any other great ideas for incorporating a purple shag rug into my decor.